My kids will tell you I have a thing about chickens. They used to show up in my artwork a lot. A few years ago if you handed me sidewalk chalk, or finger paint, chances are I would have drawn a rooster. 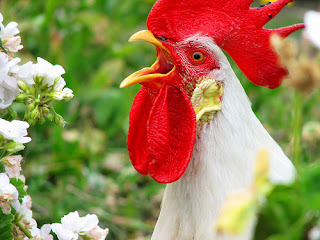 I have a collection of chicken photo clippings, and a lot of downloaded jpegs, too. The photo above shows a sock puppet friend of mine, named Nicker who has appeared on my blog before. When I see chickens (or ducks) I have a strong impulse to pick them up. I never actually get close enough to do this, and I know what I'd get if I actually tried, but the desire is powerful. Maybe I have a chicken thief in my pedigree somewhere. The pattern of reds and whites on leghorns and other white breeds drives me crazy. I have drawn and painted their wattles, face, eyes, bills... It's a composition thing, again, that game I play all the time with shapes and forms I'm seeing. A rooster appeared in one of my watercolors in the last year. This is "Singing the Catfish's Song" and he's the one singing, with the robin playing harmony. 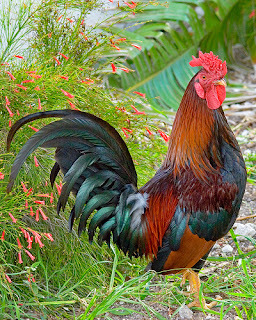 The rooster in the painting was inspired by the photo above. 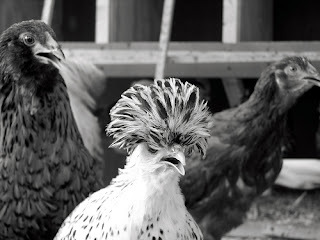 Some of my favorite chickens are the ones with top knots. I have a photo clipping of a Polish Blue that makes me stop and stare every time I flip through. The colors and subtle feather patterns on these breeds, and the colors of their eggs, are amazing to me.